Quilty Habit: "What would I do in my life without quilting?" "What would I do in my life without quilting?" "We sat in the courtyard and sewed all afternoon in the sun--that's where I finished most of the baby quilt I just showed at the guild. Then we would go out to dinner and after dark we sat around the dining room table and did our best with the feeble overhead light. One advantage of hand-sewing--we didn't have to drag machines out west! What would I do with my life without quilting?" That statement sat with me. What WOULD I do in my life without quilting? Read more? Write more? Watch more TV? Exercise more? Do more dishes (lol)?... Throughout middle and high school, I looked for my crafty outlet. I was addicted to scrapbooking for a while - something my mom and I did together all the time. But then it became somewhat cumbersome (Example A: I have two whole scrapbooks that are sitting waiting to be started - all the pictures are even ready!). Now, sewing, fabric collecting, blogging, and quilting are EVERYTHING to me. Whenever I don't have much planned, besides the inevitable schoolwork, I sew. And it is FABULOUS. I've made so many friends just in the past three years through quilting. Of course, many of them are YOU, who I have swapped with, and chatted with online just because we love it all :) At first, I was SOnervous about going to the interest meeting for the Central Jersey Modern Quilt Guild in December 2011, because I didn't think there would be anyone near my age there. I was a senior in college at the time. That was naive because I learned that age doesn't matter when it comes to an art form. Now, I'm the webmaster and VP, and it is so fun to see my friends every month, in person, to talk about quilting and sew with! I've made all kinds of things for my friends, family, and apartment. I've even shared my quilts with local first graders. I've sold t-shirt quilts and lanyards to people all over the country, and this blog has been a vehicle for my creative outlet. It makes me happy beyond belief to know that I'll have quilting for the rest of my life. That is, until my new Janome takes its last breath. I'll probably cry a river. Then, I'll have to go buy another machine... but that day is very far away indeed. ;) Either way... I finally feel at home with my creative outlet. I just wanted to share my thoughts about this. Thanks, Lee, for sharing your thoughts. What would YOU do in your life without quilting? I started quilting the year I graduated from college. When I finally started full time teaching after earning my certificate 3 years later quilting really took a back seat. Elementary kids are mentally tiring! Then a move about 5 years later left me with minimal sewing. Years of illness stopped sewing altogether, then grad school. I did turn to other creative activities when I was disconnected from quilting-scrapbooking briefly, jewelry making,drawing/watercolors, other small sewing. But when I started quilting again it was like a body part had been found again! I've been quilting almost 4 years, and it has definitely become an integral part of my identity! I'm not sure what I would do with out it, it gives me focus and momentum. It also keeps me thinking critically and creatively. And it's given me something to do other than be a Mom--which is incredibly demanding emotionally and physically. Quilting has become that my outlet, it keeps me happy and sane. Quilting has been a life saver for me. We live on a farm. Farmlife is extremely isolating all year long. My blog and quilting has been wonderful for my heart! I think we are pretty much all thinking the same thing....there is no life without quilting!! The friends I have made make it all worth it! Thanks for letting us look into your quilting world. I love this post! What WOULD I do without quilting?! When I go a day or two without turning on my sewing machine, I get anxious and grouchy. I've found that I need to read like I need to sleep, and quilting is getting pretty close in priority! I also love how it opens up an avenue in my life for love, generosity, and sharing (you make a quilt FOR someone, to keep them warm; you swap ideas, critiques, and compliments--and sometimes, fabrics!--with other quilters). I feel the same way as many people who quilt do. I love it!! I can't see my day with out it. I am an illness that keeps me from working. I wanted to become a nurse. I had been a CNA in a nursing home for many years and had just started back to work when I became sick. All my dreams were ripped away. My children were still very young so between them and my illness I was busy. But then after an 18 month stint in taking care of my failing father-in-law before he passed away I was bored. The kids were older and I felt better. I got into reading quilting blog and have been hooked since then. It has filled my time with fun and love. I have enjoyed running along the same quilting path as you. I guess we all quilt for the love of it, nothing else matters. love your post! 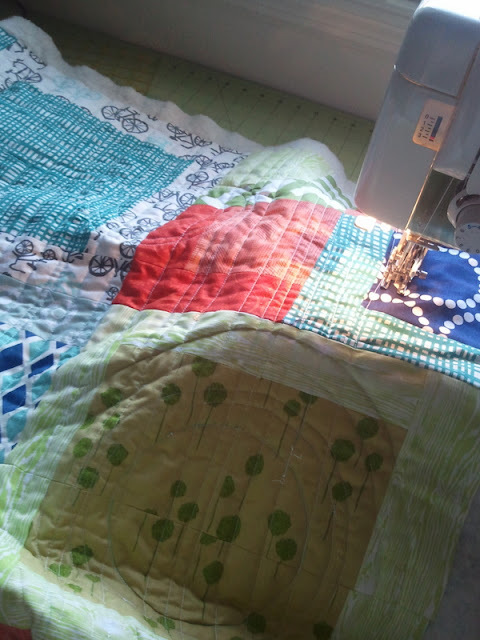 I think without quilting, I would not feel like myself, and I would carry a lot more of my stress around (not to mention, that I would probably eat everything in my pantry when under stress). It is something that I consider a need in my life, and it keeps our whole family happier! btw- I love your blocks on your design wall- they rock! I'd fall back on knitting, I'm sure but there would be some hand-stitching or embroidery too! Guest Blogging on Color Harmony!